Cookoo’s Smartwatch is a nice fusion of a traditional analog and new school digital. But before you let your mind run wild with this, you should know smartwatch doesn’t mean what you think it does. 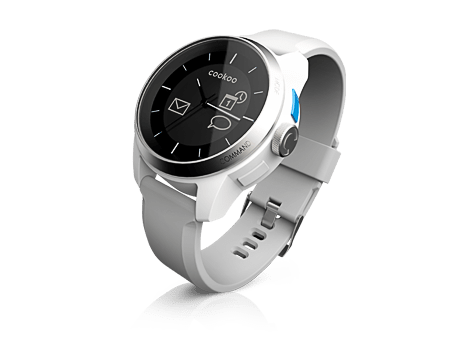 Instead of a super watch with the ability to fetch your email, predict weather and cook breakfast, Cookoo smartwatch is more of a companion to your already existing smartphone. The smartwatch can connect to your iOS device (only iOS app available for now) via bluetooth to collect updates. Text messages, email’s, phone calls, calendar appointments and even specifically app notifications like facebook are supported. You can even use the watch to remotely take pictures on your smartphone. Although you can’t preview the actual events, the watch will simply beep to let you know your phone is requiring your attention. The iOS app lets you select what events and app notifications to allow to the watch. Priced at $130 you can find it at your local AT&T store today. The COOKOO watch is a beautifully designed analog watch with easy-to-read icons that display the information you need anywhere, anytime. The smart, user-friendly interface will keep you connected, and help manage your phone, apps, and social networks on the go. Receive alerts for your incoming and missed calls, Facebook chats and messages, reminders, and more on the intuitive watch face. The free COOKOO app lets you prioritize and filter alerts and select which notifications you want to receive on the watch, and you can decide whether you want to be notified by an icon, beep, or vibration. Check in on Facebook (with more social networks to come). Tag your current location on the map. You can add notes, pictures, and even share your map with others. Remotely trigger your device’s camera – now everyone can be in the picture. Locate your phone by simply pressing a button to sound an alert. No thanks. I wore a Motorola SkyPager watch on my wrist for nearly 10 years. My days of plastic, geeky watches are far behind me.